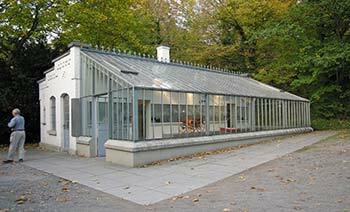 ABOVE: Gottlieb Daimler and Wilhelm Maybach pioneered the internal-combustion engine, the horseless carriage, and the motorboat at this greenhouse in the Stuttgart suburb of Bad Cannstadt. Historians may not agree on who invented the autombile, but one thing is for certain: the four-stroke gasoline engine was pioneered by Gottlieb Daimler, who--with his business partner Wilhelm Maybach--built the first high-speed "universal motor" in 1883. The single-cylinder horizontal engine, which used a glow-tube ignition, ran at a then-phenomenal 600 revolutions per minute with a horsepower of 0.25 hp. In 1885, the two men patented their half-horsepower "Grandfather Clock" engine (see photo on page 2), which was used to power a two-wheeled "riding car" or motorcycle, a horseless carriage, and a motorboat by 1886. The newer engine was the predecessor of today's car engines with its sealed crankcase and upright design. "Daimler and Maybach worked day and night and in complete secrecy. Even Daimler's family and domestic staf had no idea of what was going on in the greenhouse. A suspicious gardener called the police, believing that the greenhouse was a money-counterfeiting workshop. It was to everyone's great surprise that the police found nothing but tools and engine components in a night-time search. Daimler and Maybach were left alone to continue their work." The Gottlieb Daimler Memorial is open Tuesday to Sunday from 10 a.m. to 4 p.m. Admission is free. To reach the memorial, follow local road signs to Stuttgart-Bad Cannstatt, then park near the Kurpark. The greenhouse is at the southern edge of the park. If you'd rather use public transportatation, take the S-Bahn to Cannstatt, ride Tram 2 to the Kursaal stop in Teinacher Strasse, and continue about three minutes on foot to the memorial at Taubenheimstrasse 13. The Gottlieb Daimler Memorial is one of several museums and historic sites under the auspices of Mercedes-Benz. For more information, see our articles about the Mercedes-Benz Museum and the Mercedes-Benz Classic Center where vintage cars are restored. Wikipedia also has an interesting article on Gottlieb Daimler.